With the WMA Self-Clearing Permit, visitors no longer have to locate an information booth, grab a card, find a pen, and write in their entrance or exit information. And more importantly, LDWF no longer has to suffer through the process of gathering WMA data. The Self-Clearing Permit app provides WMA visitors with the ability to create an account and easily complete the entrance and exit surveys at any point during their visit. With step-by-step forms and scrollable option menus, users can easily find and complete all required documentation from their mobile device. Visitors also receive a checkout reminder notification after twenty-four hours and receive an email three days later if they still have completed the checkout. Understanding the limits of network connectivity in the wilderness, our mobile developers built the app with offline data syncing. This function captures all data in-app and transmits the information to the server once the user’s device makes a network connection. 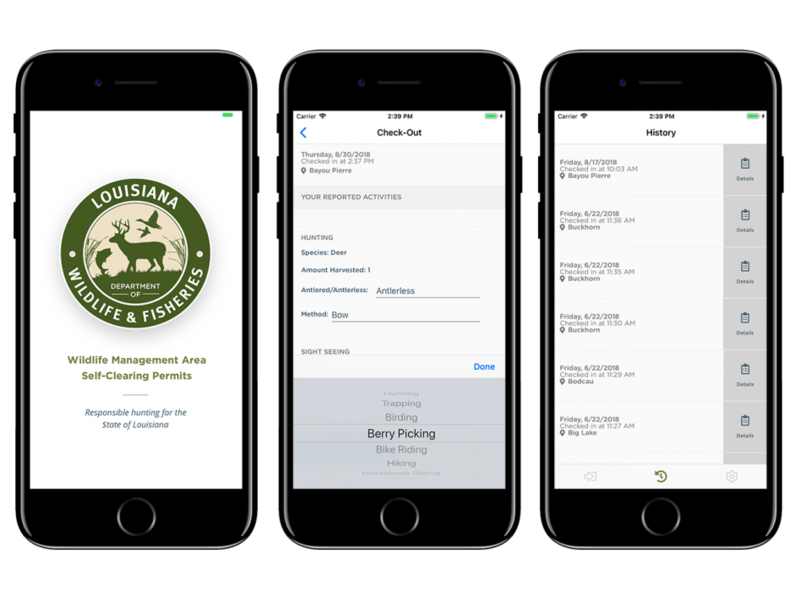 With its features and convenience, the Self-Clearing Permit app provides the LDWF team with organized and automatically linked check-in and check-out data. Additionally, all information is easily exported in the preferred formats, streamlining data analysis for the LDWF team.